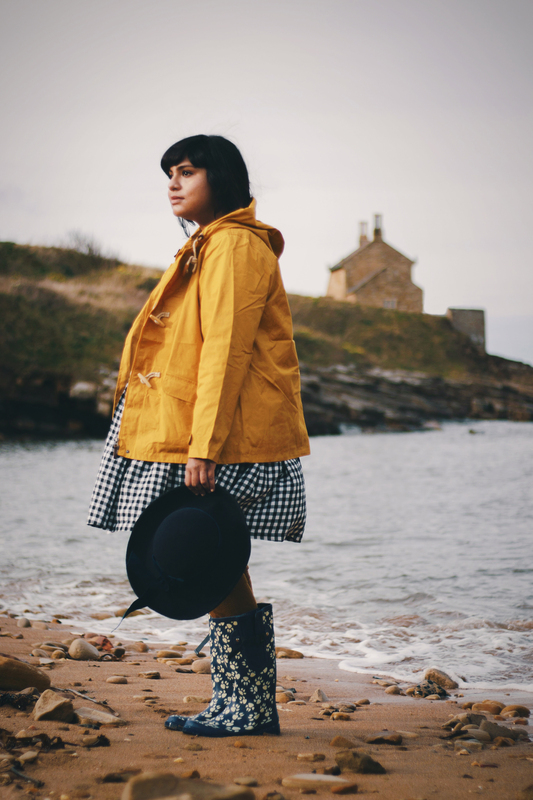 Plus size fashion blogger Ragini of A Curious Fancy styling a pair of navy blue paw print wellies from The Wide Welly Co. with a black and white gingham smock dress, mustard yellow anorak and navy blue vintage hat. She’s standing on the sand dunes at Howick with the beach and rocky cliffs visible in the distance behind her. Here I am again, with a brand new blog and a brand new outfit post to go with it! After almost a decade on Tumblr, this is the biggest overhaul the ole’ blog has had and doesn’t it look spiffy? 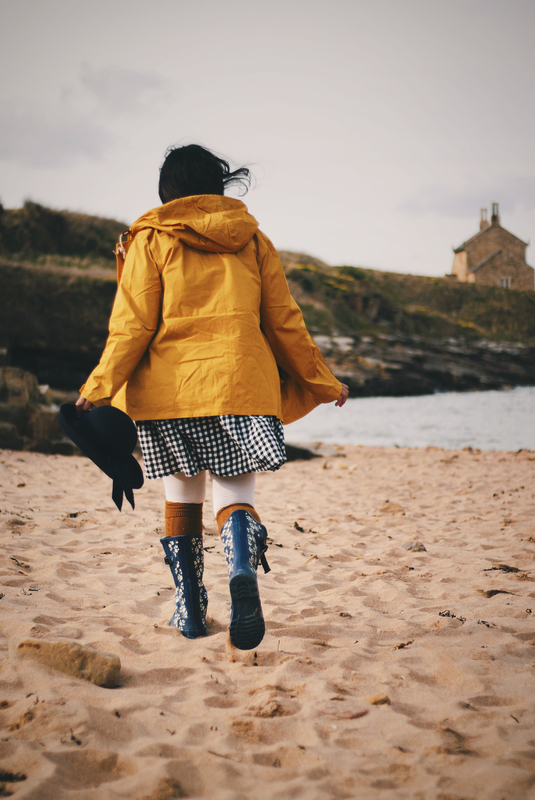 Last weekend, we drove up to the Northumbria coast at Howick and took my new plus size wellies from The Wide Welly Company for a test run. 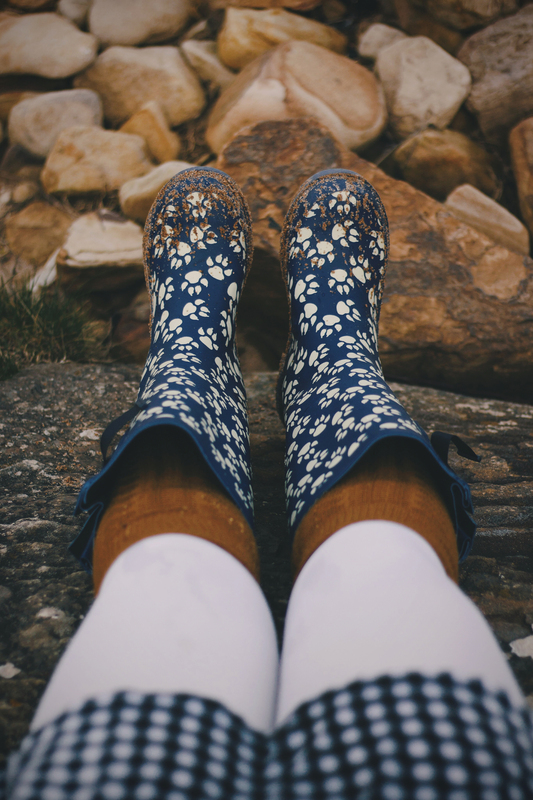 In this changeable March weather, wellies are pretty much the perfect footwear for a day at the beach, especially when that beach is in the north of England! While my 15 inch calves do fit into standard issue wellies, it tends to be a pretty tight squeeze that seldom leaves room for anything else – things like thick, woolly socks for instance. Which is why I was super excited to try out this pair of wide calf wellies from The Wide Welly Co.
Plus size fashion blogger Ragini of A Curious Fancy styling a pair of navy blue paw print wellies from The Wide Welly Co. with a black and white gingham smock dress, mustard yellow anorak and navy blue vintage hat. 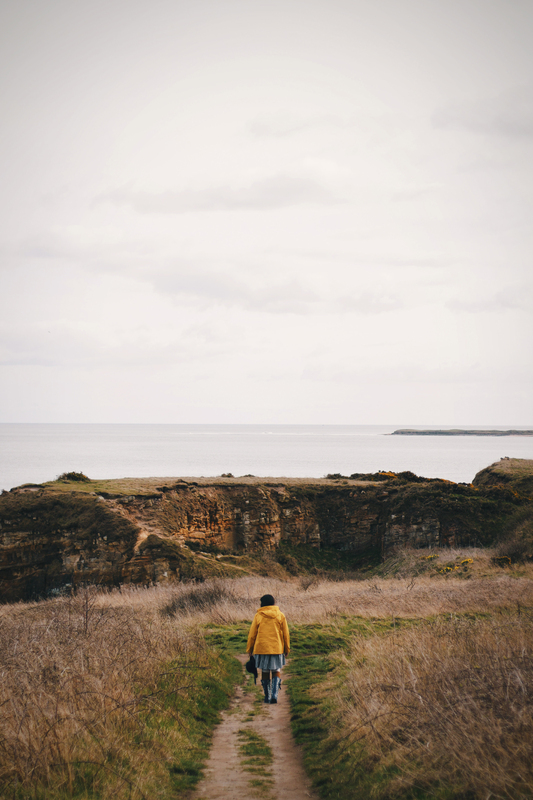 She’s walking on the beach at Howick, Northumberland. Each of their seven styles comes in sizes 4-10 and is expandable up to a 52cm calf (that’s about 20.5 inches.) There’s also a handy strap and buckle attachment that you can use to adjust the wellies to your calf size. The insides are lined with a treated polycotton lining that feels really soft and fleecy – my favourite thing about these boots! I also loved the fact that I could scramble up cliffsides and down steep, rocky trails in these wellies without the fear of losing my footing. At six months (!) pregnant, that’s not as easy as it used to be! Overall, I felt that my Wide Welly Co. wellies were the perfect combination of style and function – how cute is that paw print?! – for this little excursion to the coast, and I’m looking forward to taking them out on many more adventures in the future! I completed the nautical themed look with my new Seasalt jacket and old gingham dress from my tailor early last year. A woolly pair of knee socks by Tabbisocks and a new to me vintage hat added just the right mix of function and whimsy. Owen called this my Paddington bear look, and I can see where that’s coming from! For a landscape like this, though, it felt perfectly appropriate to draw some inspiration from classic British kidlit – don’t you think? 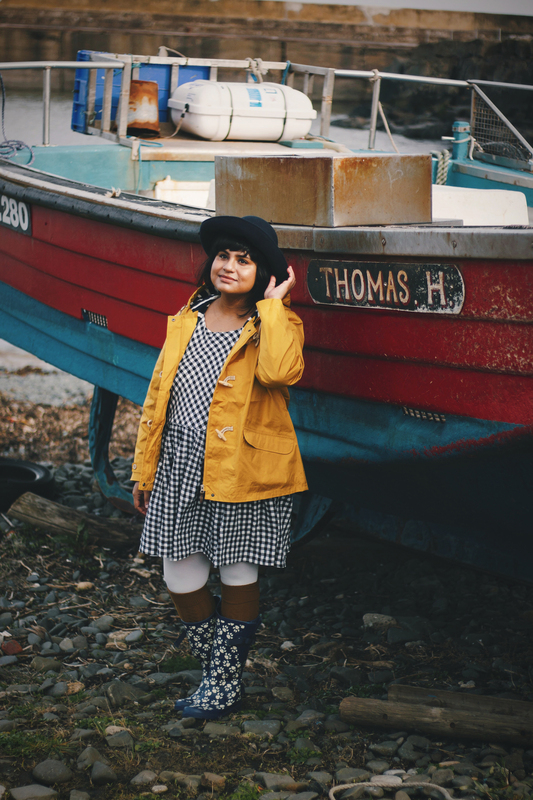 Plus size fashion blogger Ragini of A Curious Fancy styling a pair of navy blue paw print wellies from The Wide Welly Co. with a black and white gingham smock dress, mustard yellow anorak and navy blue vintage hat. She’s standing in front of a fishing boat at Craster Harbour, Northumberland. Plus size fashion blogger Ragini of A Curious Fancy styling a pair of navy blue paw print wellies from The Wide Welly Co. with a black and white gingham smock dress, mustard yellow anorak and navy blue vintage hat. She’s standing on the beach at Howick, Northumberland. 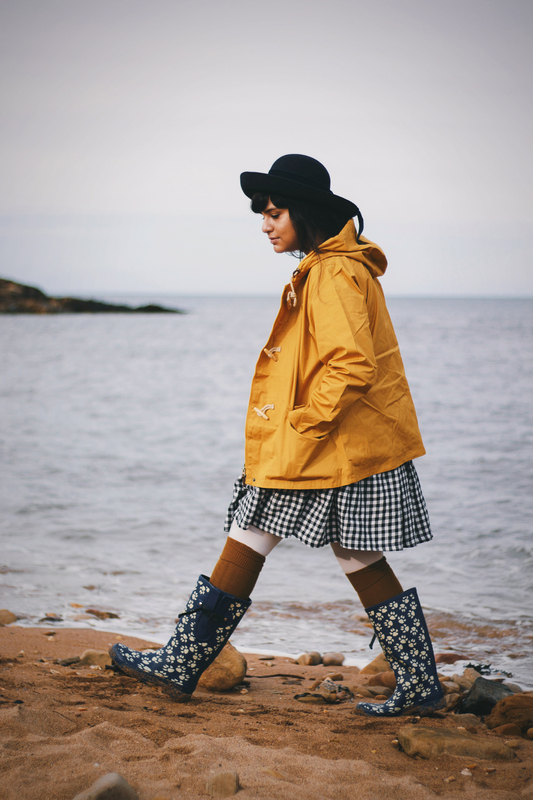 Plus size fashion blogger Ragini of A Curious Fancy styling a pair of navy blue paw print wellies from The Wide Welly Co. with a black and white gingham smock dress, mustard yellow anorak and navy blue vintage hat. She’s running on the beach at Howick with Howick bathing house visible in the distance behind her. 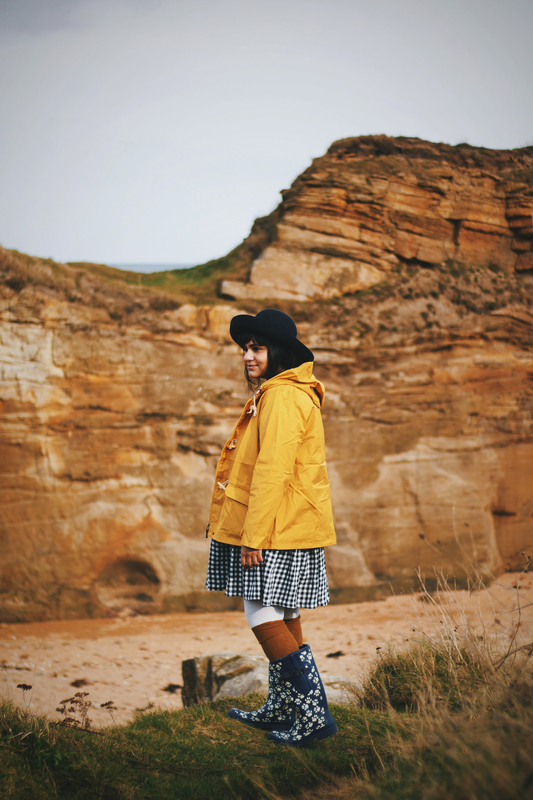 Plus size fashion blogger Ragini of A Curious Fancy styling a pair of navy blue paw print wellies from The Wide Welly Co. with a black and white gingham smock dress, mustard yellow anorak and navy blue vintage hat. 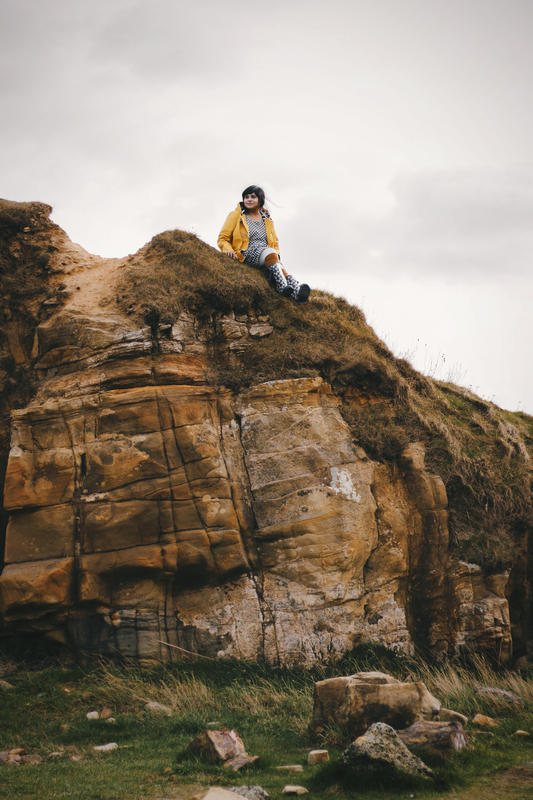 She’s visible in the distance, sitting atop a rocky cliff overlooking grassy dunes at Howick, Northumberland. Plus size fashion blogger Ragini of A Curious Fancy styling a pair of navy blue paw print wellies from The Wide Welly Co. with a black and white gingham smock dress, mustard yellow anorak and navy blue vintage hat. She’s visible in the distance, walking along the sand dunes at Howick, Northumberland. 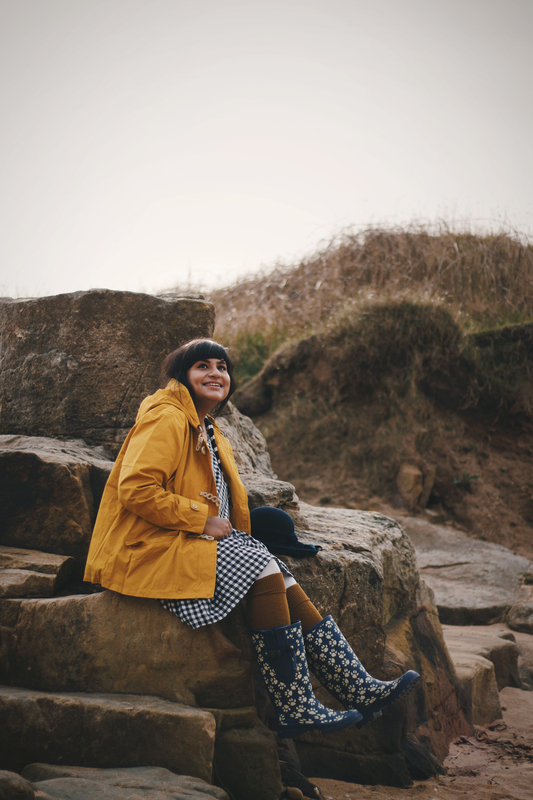 Plus size fashion blogger Ragini of A Curious Fancy styling a pair of navy blue paw print wellies from The Wide Welly Co. with a black and white gingham smock dress, mustard yellow anorak and navy blue vintage hat. She’s sitting on the rocks at the beach at Howick, Northumberland. Plus size fashion blogger Ragini of A Curious Fancy styling a pair of navy blue paw print wellies from The Wide Welly Co. with cream tights and ochre yellow welly socks. She’s sitting on the rocks at the beach at Howick. Only her legs are visible in this shot. 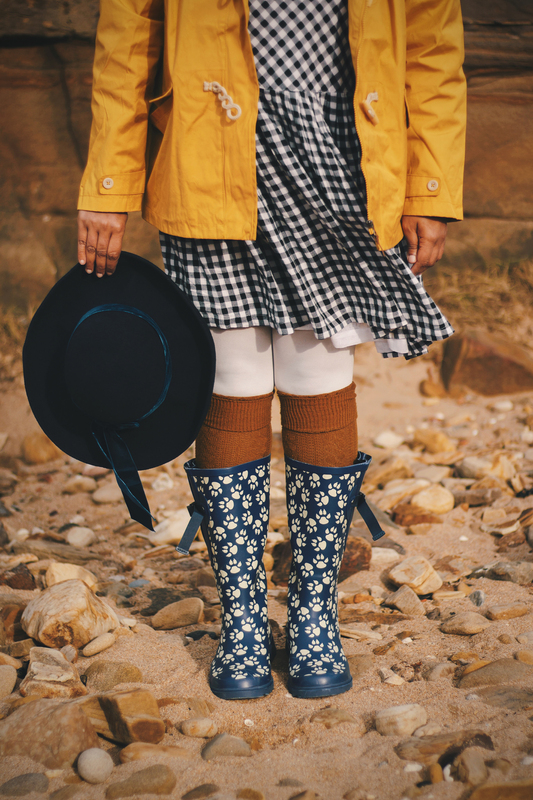 Plus size fashion blogger Ragini of A Curious Fancy styling a pair of navy blue paw print wellies from The Wide Welly Co. with a black and white gingham smock dress, mustard yellow anorak and navy blue vintage hat. She’s standing on the beach at Howick with Howick bathing house visible in the distance behind her.